The following service may be of great interest for business enterprises. 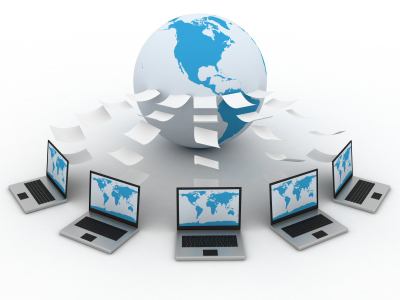 It allows to eliminate considerably the expenses on additional software. If you plan to outsource your email service here is the list of email hosting providers to choose from. Everyone.net offers a hosted messaging solution that provides enterprise-class reliability and a spam-free Inbox. It has a feature-rich AJAX interface and functionality. With everyone.net you can get mobile email hosting for BlackBerry and Treo, up to 10 GB of storage. EnterGroup provides a wide range of hosted email services, from a Family plan to outsourced solutions for organizations needing tens of thousands of mailboxes. EnterGroup also provides a pass-through solution with user-specifiable pricing for those seeking to set up a for-fee vanity email service. FuseMail‘s email hosting solution provides businesses with a reliable way to outsource email, contacts, calendars and tasks. It will help you to reduce costs, increase productivity as a result of our spam and virus filters, and better communicate with employees through the sharing features. The service is available for both the individuals and for the large enterprises. Hushmail offers an affordable solution whether your hosting needs include a personal website or an online store. It provides up to 1.5 GB storage, 80 GB transfer limit, Access, MySQL and Microsoft SQL Server. LoadMail Business E-Mail allows companies to budget expenditures and identify the cost associated with their e-mail needs. Businesses can plan for the future without unexpected overhead or the need to purchase hardware and/or software. OutblazeSME is a service that provides small and medium enterprises or home users with email, collaboration and productivity tools. It powers over 40 million active mailboxes. If the enterprise has less than 200 people, Outblaze can provide it with professional with professional messaging system without any troubles and expenses usually associated with it. Outblaze SME is perfect for avoiding the costs associated with spam and email viruses. Outblaze SME is available only to customers in Asia. Runbox provides professional email services, Premium Email Hosting, and Web Hosting for personal and business use. Runbox enables true online email consolidation and storage hosted on fully redundant carrier class networks ensuring fast, reliable, and secure services. Runbox offers 30 days trial. With Runbox Email Hosting you can manage email for your domain within your Runbox account. This means that you can have email sent to you@yourdomain.com arrive directly in your account. Then you can set up Runbox to appear as sending from you@yourdomain.com, while taking advantage of Runbox’s management features. With SwishMail you get 25 configurable email boxes, 2,000 MB of disk space, 60 GB monthly in data transfer, and many more. WebMailUs allows you to access your email from any web browser without needing any email software installation. It includes built-in Search, providing webmail users with the ability to find email messages as quickly as they can search for them. There are standard protocols that allow you to use your favorite desktop software like Outlook and Thunderbird and wireless devices such as Blackberry and Treo. Webmail plans come with 1GB, 5GB, or 10GB of storage, per mailbox. Additional storage can be added on a per mailbox basis to 1GB email accounts. Incoming and outgoing message size limits are set to 70 MB. User mail helps your company benefit greatly by adding e-mail to the infrastructure, no matter is it a small enterprise or a large one. There are many benefits in outsourcing the e-mail needs. There is a substantial price in maintaining and housing an E-mail server. These include the cost of the server, backups, filtered and emergency power and a T1 line to the Internet. Outsourcing your e-mail allows for you to free up an Network Administrator from the duties in maintaining the e-mail system. Your business saves money by avoiding the cost of Software Such as Lotus Notes, Novell’s GroupWise, or Exchange.